Why is Genie Oil “Troubleshooting” North Korea? What happened to Richardson’s pay-to-pay investigation? 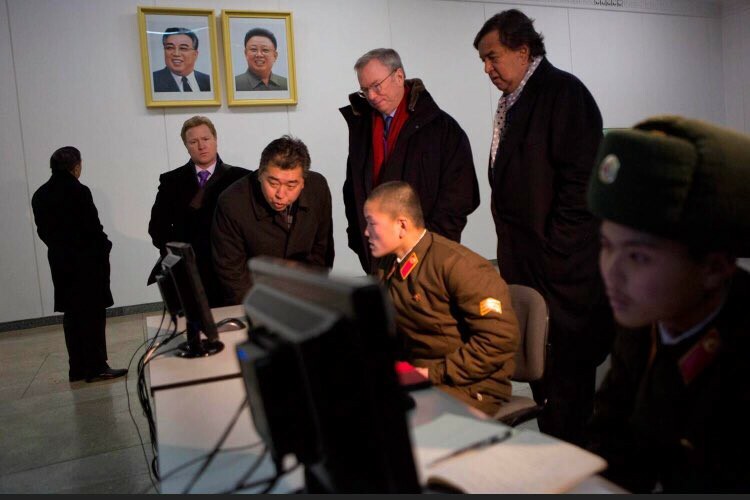 Why would the paranoid North Korean government allow the CEO of Google to snoop around their computers? Why does North Korea like Richardson so much? “Troubleshoot” is a term often used in the tech industry. Are we all being trolled? - The first trip of Andrei Karlov to North Korea was in 1976. In what capacity? - What are the brightest moments of his life, do you think, in this book exactly entered? - I think first of all — Korea. Still, in total we spent 21 years on the Korean peninsula. It was there that Andrey was formed as a good analyst, practitioner, negotiator. And when in 2001 he went to the DPRK as an ambassador, this country was for us a native, in fact — the second motherland. We liked everything there — culture, food, nature, people … Yes everything! Ambassador Karlov spent most of his diplomatic career on the Korean peninsula before becoming Russia’s ambassador to Turkey, and according to his wife he was planning on writing a memoir. What secrets about North Korea did Karlov take to the grave? And could this have been the real motivation behind his assassination? Ostensibly, Karlov was killed in an attempt to stop the Turkish government from uniting with Russia — thus ending its efforts to overthrow the Assad government in Syria. The overthrow of Assad, specifically because of oil disputes, has been an explicit goal of the U.S., Israeli, and Turkish governments ever since it was Bashar al-Assad’s father Hafez al-Assad running Syria. And when I say explicit, I mean the CIA actually underlined it and specified: this is the only reason we are doing this. The goals do not appear to have changed under a Trump administration. Genie Energy has been drilling for oil in the disputed Golan Heights region of Syria. Jason Greenblatt, Trump’s adviser to Israel and America’s first ever “Special Representative for International Negotiations” owns stock in Genie. He’s also apparently related to the Rothschild family through someone named Karen. Lord Jacob Rothschild is one of the eight members of the Genie Strategic Advisory Board. Trump’s incoming National Security Adviser Michael Flynn made his first infamous phone-call to Russian diplomat Sergey Kislyak on December 22nd 2016, 3 days after Karlov’s assassination. 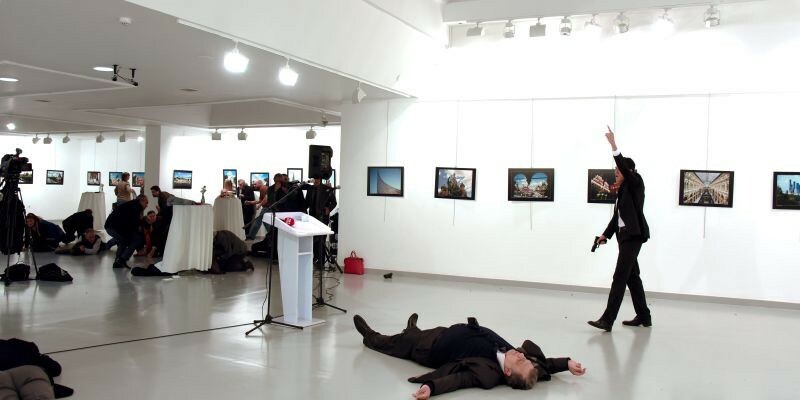 Flynn, who wrote an op-ed on election day demanding the extradition of Turkish exile Fethullah Gulen, undoubtedly wanted to express condolences to the Russian government in the wake of their ambassador to Turkey being gunned down in broad daylight by a police officer. We also know that Flynn “asked Russia to delay or defeat a U.N. Security Council resolution, approved Dec. 23, 2016, that would have condemned Israel’s building of settlements in the West Bank and East Jerusalem”. Flynn plead guilt simply to lesser charge of lying to the FBI (about what was discussed in the phone calls). And to make matters worse, Woolsey — who appears to have played an integral role in getting Flynn fired as National Security Adviser — was working with the same Turkish businessmen as Flynn because they thought he could help them bring down Fethullah Gulen. The U.S. must be prepared to preempt North Korea by any means necessary — including nuclear weapons. Woolsey’s warning that America may have no choice but the preemptively nuke North Korea — because their space weapons could kill almost every single American — rings false, especially when considering how much Russia and China’s space programs intimidate the U.S. government. Russia and China first proposed their “Treaty on Prevention of the Placement of Weapons in Outer Space and of the Threat or Use of Force Against Outer Space Objects” in 2008. The Obama administration rejected it in 2015. So why is the former CIA director (and member of Genie’s Strategic Advisory Board) telling us that we’re not afraid enough of North Korea’s space weapons program — while omitting Washington’s refusal to negotiate with Russia and China on their obviously far more powerful space weapons programs? Woolsey’s hyperbolic warning about North Korean space weapons, while omitting a decade of Russia and China urging a treaty on space weapons, seems disingenuous at best. Again, no mention is made of the ten years the U.S. government has spent rejecting Russia and China’s proposed space weapons treaty. Every discussion of North Korea is about how to pressure Russia and China to stop North Korea’s weapons program. We know from Secretary Clinton’s leaked Goldman Sachs speeches that the Obama administration threatened to surround China with a ring of missiles if it didn’t shut down North Korea’s nuclear weapons program. One wonders if warnings about North Korean nukes are really a pretext for action against the far more powerful Chinese and Russian military capabilities. Why else keep the public in the dark for ten years about Russia and China’s space weapons treaty? For Trump “resistors” who cheered Jim Woolsey taking down Michael Flynn, there’s another reason to be skeptical of Bill Clinton’s former CIA Director’s intentions. In addition to being on the Strategic Advisory Board for Genie Oil, Woolsey is the Chairman of the Foundation for the Defense of Democracies. Foundation for the Defense of Democracies (FDD) President Clifford Mays was Communications Director for the Republican National Committee before founding FDD shortly after the September 11th attacks. Genie Energy was also founded in 2001 immediately after the 9–11 attacks. And Woolsey isn’t the only connection between Genie and FDD. Genie Strategic Advisory Board Chairman Michael Steinhardt was one of the early financiers of the think tank. “Steinhardt is a hedge fund mogul who contributed $850,000 to FDD from 2001 to 2004”. In 2015 FDD lobbied against the Iran nuclear deal. FDD also has a Michael Flynn connection. Their Iran expert Dr. Michael Ledeen co-wrote Flynn’s book “Field of Fight: How to Win the War Against Radical Islam and its Allies.” For some reason, “Resistance” press has now gone silent on FDD despite its numerous connections to the Trump administration. But the MSM was never vocal about Genie Energy to begin with. Even heavy investment by Renaissance Technologies (whose CEO Robert Mercer helped fund the Brexit movement and the pro-Trump Breitbart publication) isn’t enough for the “Resistance” press to shine a spotlight on Genie. Pressed that this approach could drag the US into a highly volatile and unpredictable war with Iran and its proxies, he was unfazed. …Regarding the Iran deal, unlike former CIA director Michael Hayden, who told the Post in October that he was in favor of fixing the deal but against Trump’s decertification of the deal, Woolsey was disappointed that Trump did not scrap the deal entirely. …Woolsey was critical of Trump for leaking Israeli intelligence to Russia and for his propensity for broadcasting so much of his national security strategy. One has to assume at this point that Trump’s “Resistance” press continues to ignore organizations like FDD and Genie — while warning about the dangers of Trump’s foreign policy — because their “Resistance” is to a personality and not his actual policies. When Bill Richardson says North Korea is engaging in a cover-up and that Celebrity Apprentice contestant Dennis Rodman “is the only game in town” because “he’s the only American that’s ever spoken to Kim Jong Un” one has to ask what the United States is covering up about its diplomacy with North Korea. It’s clear that the U.S. is heading towards military confrontation with Iran. And it’s clear that the U.S. is disinterested in deescalation of tensions with Russia and China. But we’re supposed to believe that Dennis Rodman knows more about Kim Jong Un than any of the people in this article: more than anyone at the Pentagon? More than anyone in the CIA? More than Google, whose CEO got to go there. More than anyone at Genie Energy? And even if that is somehow true, are we also supposed to also believe that the election of the host of Celebrity Apprentice is a coincidence? Russia’s North Korean troubleshooter is dead; the first American to call the Russian government about it was taken down by one member of Genie’s Strategic Advisory Board and then replaced by the biggest North Korea hawk in the entire Trump administration. 13 months later yet another Genie board member who was involved in the controversy hasn’t spoken a word about what Ambassador Karlov knew. What was he planning to write about North Korea? And why would — not only the U.S. government — but also the North Korean government, stay silent on the assassination of their longtime Russian counter-part at the hands of a police officer from a NATO nation? The North Korean government isn’t the only one engaging in a cover-up. Where’s a real troubleshooter when you need one? And what the hell ever happened to Bill Richardson’s corruption charges that were dropped but that he was never technically “exonerated” from? I cited F. William Engdahl in my most recent article “Pacific Gaslight: Why Big Brother Needs A President You Hate” for his startling conversation with a former CIA agent about how America needed the North Korean threat in order to justify its continued military presence in the Pacific after the Cold War ended. Engdahl says North Korea is a “vassal state” of the United States. …when one country after the other comes closer in economic and political cooperation to Russia, to China and to their growing Eurasian economic cohesion around the One Bridge One Road Eurasian infrastructure great project, it was clearly time to install a Plan B President. To do that preparation, a deception strategy that will fatally weaken the developing deep bonds between Russia and China will be priority. It’s already begun. We have a friendly phone call from The Donald to Vladimir the Fearsome in Moscow… It’s classic Kissinger Balance of Power geopolitics–seem to ally with the weaker of two mortal enemies, Russia, to isolate the stronger, China. Presumably Vladimir Putin is not so naïve or stupid as to fall for it, but that is the plot of Trump’s handlers. Such a strategy of preventing the growing Russia-China cooperation was urged by Zbigniew Brzezinski in a statement this past summer. Because he’s been selected (and not by us dear voters) to play a definite role… for reconfiguring the Sole Superpower strategy. Comedian (sort of), Teacher (substitute), Homo sapien (probably), Obsessive Compulsive News Junkie (definitely). Using Twitter to study public discourse.